Look, I get it, you're angry. You're seething with pent up rage-click fervour. You already hate me almost as much as you hate that phoney, good-for-nothing fraud of a footballer that is Karim Benzema. I get it. You've preyed on this poor, undervalued Frenchman for a while now. He's an easy target. He doesn't score 'enough' goals, doesn't step up on the 'biggest stage', doesn't carry the team on his back when the going gets 'tough'. Whether you're in the "tad overrated" (and I know you're here, Gary) camp, or the ​"biggest fraud in football history" one, or the "​If Real Madrid Don't Sign a Replacement for Karim Benzema This Summer They're Big Stupid Idiots" one (definitely the worst of the lot), you're all waiting with belligerent, baited breath, ready to pounce. Some of you might have even prepared your arguments after Benzema scored his brace against Eibar last Saturday. "Where was he against Valencia?!?!?!?!" "Well, where was his brace?!?!?!?!?" He actually has six other braces this season, but it's fine, I get it. This won't be easy. But it's fine: I also came prepared. It essentially boils down to this: what, exactly, do you want out of Karim Benzema? Do you want him to score 30-plus goals a season? Because he did that in the first year of his 20s. Do you want him to back up his talent with trophies? Because he's done that 17 times over, and that's only the major ones. Did you want him to step up to the plate after ​Cristiano Ronaldo, the man who he had served so dutifully in spite of himself for nine years, left for Juventus? Because, notwithstanding both the facades and the foundations crumbling around him, he's done that more than any other Real player this term; scoring 26 goals across competitions, more than double his CR7-inhibited tally from last season. Now, at any point in his career has he been the best player in the world? No. The best player in his position? Maybe, maybe not. The best player of his nation? Probably, but it's controversial and politically multi-layered, so let's not go there...although if he had a World Cup winners medal, would you still be so inflammatory? My point is, it's ok to not be the best player in the world. To not score 75 goals and 57 assists per calendar year. To not win five Ballon d'Ors in a row. Thanks to that dynamic duo of ​Lionel Messi and Cristiano Ronaldo, we are constantly asking their fellow colleagues to step up, constantly reflecting their ridiculous numbers back at them in the hope that somehow they are reflected back by somebody, somewhere. No, ​Karim Benzema is not Leo Messi, or CR7, maybe not even Harry Kane. But he was also the starting striker for the most successful side in Champions League history. He is simultaneously the fourth greatest goalscorer in the competition's illustrious history and a player, who for the majority of his European career, has operated solely as a facilitator. He is a player who's felt the unbridled, and usually unfair, wrath of the white handkerchief-waivers at the Santiago Bernabeu, and emerged from the other side, unscathed, even...loved? He's taken all the you-can't-speak-Spanish jibes he could, and instead of crying about it to his native press in the hopes of a return (looking at you, Gareth Bale), actually buckled down, applied himself and learned at least a portion of the language. The Bale comparison is not just a snide dig at the Welshman, it is an example of how we judge superstars, and measure their plights. 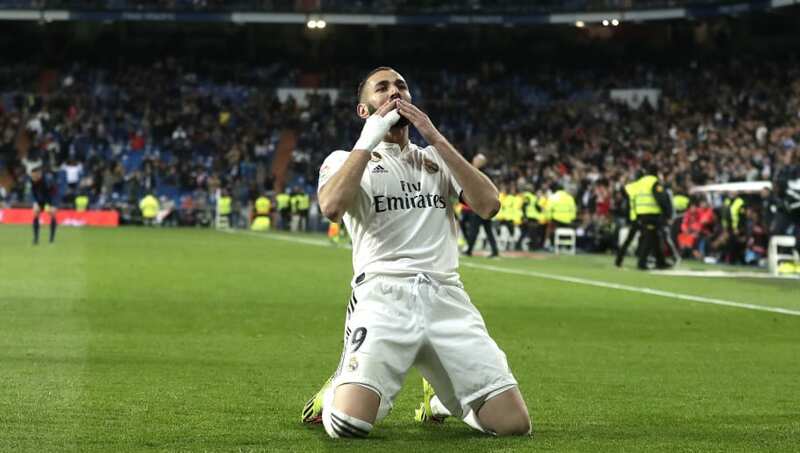 Whereas Bale is seen as an unfortunately spurned star at ​Madrid, Benzema is a racketeering fraud, who's 'sold his soul' to wear the number nine shirt at Real indefinitely. A senior figure at Los Blancos recently speaking to ​Marca declared: "They have been criticising him for 10 years and he's the best." Who that 'they' is up for interpretation, because it seems to have been everyone in the footballing world at one point or another, but it still strikes a chord. Yet it was perhaps his everlasting idol and current boss Zinedine Zidane - who played the upbeat role in the good-cop-bad-cop routine with Jose Mourinho that the Frenchman has previously attributed to his return to form after some early struggles in Spain - who put it best. Speaking after the Eibar victory, Zidane explained: "Now you pay more attention because of the goals, but the best Benzema has been seen many more times than you think." And that seems to perfectly sum up Benzema's legacy. In this generation, the goal return is what people will always look at when calibrating success - it's certainly what I've turned to at times in this very article. But there are other ways of defining greatness. Other moments that define a player's career. Other ways to significantly contribute to success. And maybe, just maybe, a player & manager of the calibre of Zizou is a better judge of that than you. Maybe.